With the new baby, Justine's Mom and Dad have been visiting for the past couple of weeks. As the baby is much more interesting than we are, they've spent most of that time on the North Shore, helping out. We offered to spirit them away for the day, and so we planned a day trip back down to Delta to visit the farm, and spent some time at Reifel seeing what birds we might find. Our first stop was the farm we visited last week, and we spent a bunch of time checking out the pumpkin patch, wandering the fields and generally enjoying the amazing weather. We bought pumpkins, some flowers and some vegetables for the week. It was a good start to the day. A redwing blackbird calls out from his perch on a cattail. After an hour or so, we headed down to the bird sanctuary. On the way in we saw that the snow geese were in one of the distant fields! We didn't stop as they were very far off, but it's a good sign, and means more photo ops in the future. We wandered around the sanctuary, for a couple of hours I think, and had some good sightings. There were tons of redwing blackbirds, waxwings, and more sandhill cranes than I've ever seen. I think we counted 23 at one point. 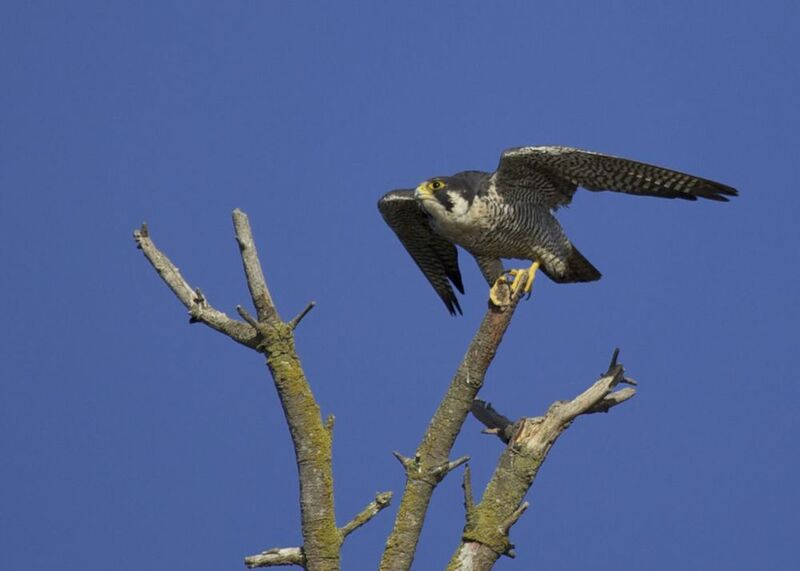 The highlight of the day was a peregrine falcon, sitting in a dead tree along the path back to the entrance. I was watching him for quite a while and was rewarded with him taking off, and flying away. He was a bit far away, but provided some great shots. The peregrine falcon just before take off. After our time at Reifel, we headed over to Steveston to have diner and watch the sunset. The sun starts to set over the harbour in Steveston.